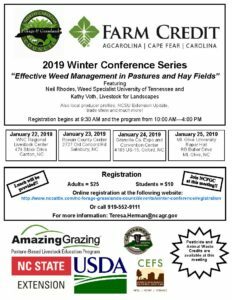 Featuring Neil Rhodes, Weed Specialist University of Tennessee and Kathy Voth, Livestock for Landscapes, and also local producer profiles, NC State Extension update, trade show, and much more! Registration begins at 9:30 a.m. and the program from 10 a.m.–4 p.m.
Register online or call 919-552-9111. For more information, please email Teresa.Herman@ncagr.gov.